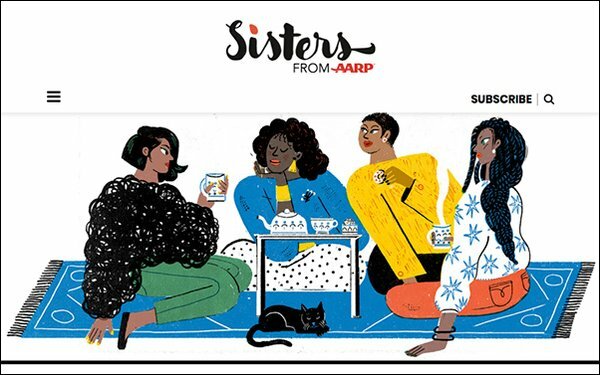 Following the successful 2017 launch of “The Girlfriend,” geared to Gen X members, “Sisters From AARP” focuses on Gen X and baby boomer African American women. The newsletter, delivered every Tuesday to subscribers, offers readers a host of content. Feature stories address culture, health and beauty. Topics include weight loss in midlife, the connection between sisterhood and mental health and beauty strategies. Career and financial advice are also addressed in stories like “How to Get Paid Like a White Dude,” while offering advice on finding the right side hustle. A section devoted to trends and travel informs readers about the best upcoming events, festivals and shows, along with city guides full of tips from local black influencers. In addition, an interactive component offers readers a playlist of 45 tracks celebrating hip hop’s 45thanniversary. "Our writers and social-media team members are opening a space where we black women can share real talk and advice about what matters to us," stated editor in chief Claire McIntosh. Earlier this year, AARP partnered with Politico to target voters over 50 in the midterm elections through a series called “The Deciders,” running monthly in Politico magazine. Combing polling, data analysis and data visualization tools built by Politico’s interactive team, the partnership has dedicated six months of content in an effort to explore what motivates this high impact demographic.